This is one of the funnest food charity events in town. Not only are there going to be a bunch of restaurants offering delicious tasting plates, there will be delicious beverages to taste as well. Come hungry and come thirsty! 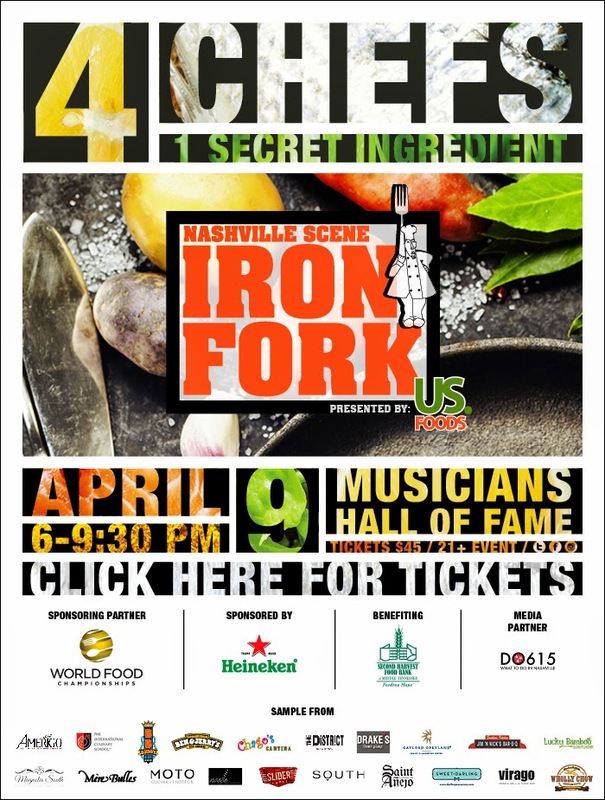 All the whilst, there will four of the top Nashville Chef's will battle it out to be the 8th Annual Iron Frok Winner. Get your ticket, and cheer on your favorite: Last year's champion, Hal Holden-Bache of Lockeland Table defends his title this year, Crystal De Luna-Bogan of The Grilled Cheeserie food truck, Robert Grace of Kayne Prime and Dale Levitski of Sinema. And, if it wasn't enough for proceeds to go to 2nd Harvest Food Bank, and all the tasting plates you could want to try, and all the beverages you are going to want to taste, your ticket will give you admission to the Musician's Hall of Fame Museum! Yes, you and all the other guests can go and view the museum all evening during the event! It is like getting a free ticket for after hours viewing of the entire Hall of Fame! That is a nice bonus! It is going to be a tough race for Iron Fork Winner #8! Get your ticket and enjoy the evening! It seems like the new big thing in food is "bone broth". Back in the day, it was just called broth or stock. Bone broth seems to be the trendy health food now, and some people are paying a lot of money to have their daily drink of bone broth made by someone else. This is akin to when juicing was all the rage. And before that, protein shakes. There always seems to be the "cure-all" drink du jour. The reality is that our grandmas, great grandmas, and great great grandmas probably made broth or stock when they had left over bones from the meat they had at dinner (this practice seems to be universal for most cultures). Those roasted bones with bits of meat, cartilage and marrow, when simmered with water and aromatic veggies, make a lovely base for soups and stews. Making the broth really uses all the bone and ingredients to their utmost potential, and does not waste one bit of the animal from which the bones came from. I am happy that bone broth is the new trend because it one way to really use the livestock animals and not let parts go to waste, and not just throwing out the bones and not re-using the bones. 1. Eat the roasted lamb off the lamb bones (These bones are from a City House lamb dish, which I ate the lamb and took home the bones. The original lamb was a well cared for local lamb from Williamson County 4H). 2. 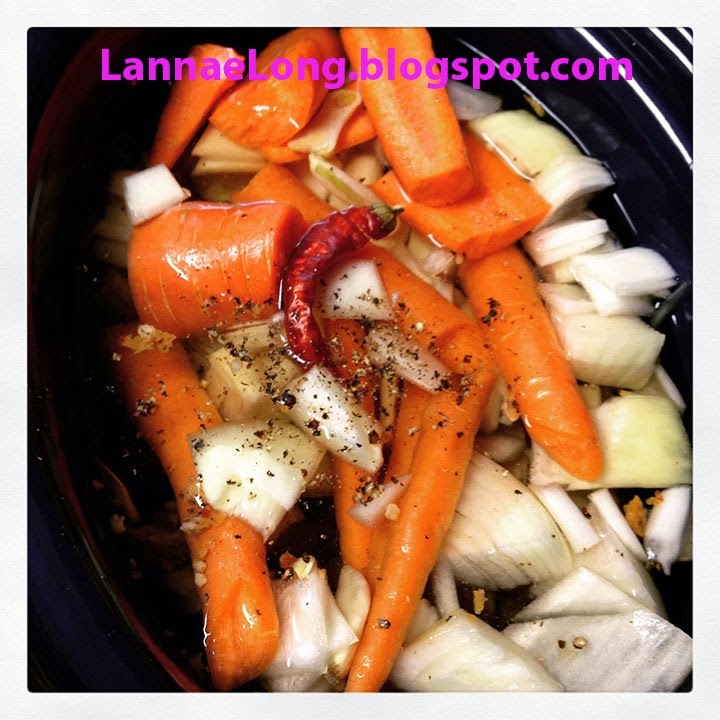 In a crock pot add the lamb bones, water, onions, carrots, salt, pepper, 1 cayenne, garlic, and a tablespoon of soy sauce. I got the garlic from the Barefoot Farmer, the cayenne is organic from my garden (and from originally organic heirloom seed) and the water is filtered from my tap. 3. Turn on the crock pot, low over night. In the morning, you have luscious bone broth. Broth can be made from any roasted bones. Beef, chicken, duck, goose, pork, lamb, venison, buffalo, ostrich, even roasted shrimp shells and fish bones, can be made into a nice broth. At one of my favorite Vietnamese cafes, the spicy seafood broth seems to have been simmered with more cayenne than I used, and lemongrass to give the broth a bright lemony aromatic character without the bitterness from the lemon pith. To have a more Chinese brothy feel, I would use roasted chicken or duck bones, a little ginger, soy sauce, and garlic as my broth base. A Western European broth would have the classic mirepoix and thyme in the broth. After my lamb bone broth is done, I am going to use it as an Asian noodle soup broth. King Market and InterAsian Market both have fresh made udon noodles. King Market folks actually makes the noodles and are usually available near the cash register. Fresh udon is so delicious. InterAsian also has fresh ramen too, in the refrigerated section in the back of the store. For the soup I make, I usually like adding peas to the soup, maybe some Chinese dumplings (from the frozen food section at King Market or InterAsian Market), and a sunny side up fried egg on top. My last batch of lamb bone broth I made, I used some for noodle soups during the week, and I froze a pint of broth for later. I am probably going to use the pint for a stew. I am not sure yet. Any suggestions? Are you looking for a Chinese Food Adventure in Nashville? I have a fun dinner club for you! 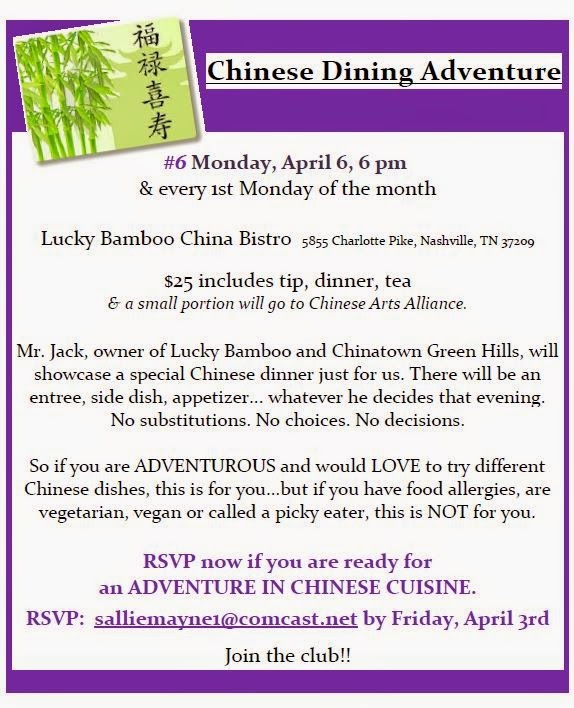 The Chinese Dining Adventure Club is free to join, and meets every 1st Monday of each month at Lucky Bamboo China Bistro on Upper Charlotte Pike. It costs $25 per visit and includes a Chef's Choice multi-course dinner, tea, water, tax and tip. The meal is Chef's Choice, and the dishes are not on the menu, rather they are Chinese regional delicacies that you cannot get anywhere in Nashville. In past months, the Chinese Dining Adventure Club had themes of Hunan, Schezuan, Malaysian recipes. All you have to do is email Sallie at SallieMayne1@comcast.net and let Sallie know you want to reserve a seat at the next Chinese Dining Adventure. RSVP to SallieMayne1@comcast.net by April 3rd. A disclaimer, this is a Chef's Choice no restrictions dining experience. As the flyer says, if you are vegetarian, vegan, celiac, have ingredient restrictions, are a picky eater, THIS IS NOT for you. There will be no special requests or restrictions at any of the meals. If all you want is just the same old General Tso's Chicken, Hunan Beef, or Sweet and Sour Pork, you can go to almost any other Chinese restaurant for that, and you will not get that here at the Chinese Dining Adventure Club. If you are adventurous, and willing to try authentic Southeast Asian dishes you cannot get anywhere else in Nashville, this is perfect for you. If you are open to a Chef's Choice experience, give this dining experience a shot. I have been to past dinners, and the food has been really good. A couple months ago, in the height of winter cold, of of Chef's courses was a winter melon soup with seafood, and it was a big hit. A winter melon is a large green gourd with white lightly flavored flesh inside. The flesh is chunked up and combined with vegetables and seafood to make a a light brothy soup that is perfect for a winter's day. Winter melon soup is anecdotally is considered a soup that helps stave off common colds, akin to chicken soup. The most recent meal was a nod to Schezuan hot and spicy dishes. One of my favorite dishes was a mung bean noodle, fish and vegetable dish seared in hot chili oil. The Schezuan chili oil made my brow sweat from the heat, the savory flavors of the fish and vegetables was inviting, and the toothy texture of the mung bean noodles made me want to go back for more. This is a fun food adventure for true adventurous eaters. Hope to see you on 1st Monday in April! RSVP to Sallie and let her know if you are coming! This is one of my favorite events like this in town. There will be over 80 tasting tables set up including some of my favorite restaurants and caterers (City House, Cork and Cow, The Corner Market, Yellow Porch, Pucketts, Margot and Mason's at the Lowe's Vanderbilt to name a few). There will be a bunch of local libations to taste as well (Prichards, Jack Daniels, Yazoo, and Corsair to name a few of my favorites). Get your tickets, come hungry and thirsty. There is plenty PLENTY of free parking in the back of NSCC. Also, NSCC is fairly centrally located, so cab, Lyft, Uber and other ride shares are fairly cheap from downtown Nashville. For those of you who want to take the bus from Downtown Nashville, it is Route 3 that starts at Bay 5 in the Center City Terminal. Checkout the bus route schedule here.